The Start Of Spring Sees Outdoor Pizza Ovens Becoming A Must-Have For The Garden, Says The Stone Bake Oven Company. The Stone Bake Oven Company, who design and make a range of professional and at home wood fired ovens, explain what makes their ovens so popular, after their peak in sales as spring begins. The recent sunny weather has encouraged many to venture outdoors and begin to tend the garden in preparation for summer parties and outdoor activities. The Stone Bake Oven Company who specialise in indoor and outdoor pizza ovens, describe how having an oven outdoors has become the latest trend to sweep the country. “Its quite understandable” says Tom Gozney the company founder, “having a wood fired oven is an easy and fun way to cook even the most simple dishes, with brilliant results. What could be better in a blooming garden, than a personalized outdoor wood fired oven, finished to suit your tastes, which can double as an outdoor garden heater?" Each New Year sees many garden loving individuals, choosing to extend their kitchens into the garden, and ditching the rusty BBQ for a more diverse and easy to use,wood burning oven by the Stone Bake Oven Company. Not a new concept, our ancestors have been cooking with fire for hundreds of years, but recent trends have seen many effectively going ‘back to the future,’ to return to their wood fired cooking roots, and to master cooking with fire. Now going from strength to strength, wood fired cooking is more popular than ever with celebrities and chefs, however the Stone Bake Oven Company has brought wood fired cooking to the masses with their range of affordable, high quality ovens, for a wood fired cooking experience without the celebrity price tag. Known for their pizza cooking talents, a wood fired oven can cook far more than just perfect pizza in less than 90 seconds, enjoy specialty bread baking abilities and countless diverse cooking techniques, all of which makes a wood fired oven the latest must have item for the garden this 2012. 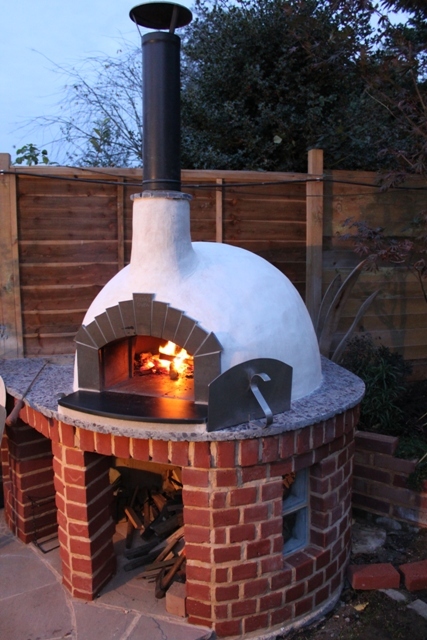 Not just for the garden either, the Stone bake Oven Company specialise in indoor and outdoor ovens, including a range of commercial wood fired ovens, which are found in restaurants across the UK. Re-discover your passions in cooking, and make family gatherings a pleasure, with a wood burning oven, hand cast in the UK, starting from £599.